The SubSurface Instruments ML-3 Magnetic Locator 18ML-3S detects hidden or underground objects made of iron, cobalt, or nickel. Objects made of these materials are called ferrous or ferromagnetic. You can adjust the ML-3’s sensitivity and block out possible interfering magnetic field signals. Look to the ML-3’s LCD meter to determine when your battery is low. And use the built-in micro-processor memory to store your sensitivity settings for future use. When the ML-3 detects the magnetic field of an object you can tell by listening to the magnetic locator’s audio tone. The audio tone emits from a special moving coil speaker that varies in pitch according to the strength of the signal. Control all the features of your magnetic locator with its four-button keypad. Power the ML-3 on or off or adjust its detecting sensitivity up or down. Use the zero-button to automatically screen out surrounding magnetic fields that may affect your location accuracy. The ML-3 comes standard with a micro-processor that stores your sensitivity settings for the future. This saves you time and energy as you move from one job to the next. Use the ergonomic ML-3 with one hand by pressing buttons on the keypad with your thumb or index finger. The SubSurface ML-3 weighs just two pounds, so you can easily carry it with one hand. Three 9-volt alkaline batteries power the SubSurface ML-3. Your batteries should last for 60 hours. But, you can rely on the LCD indicator to flash when your batteries are low. 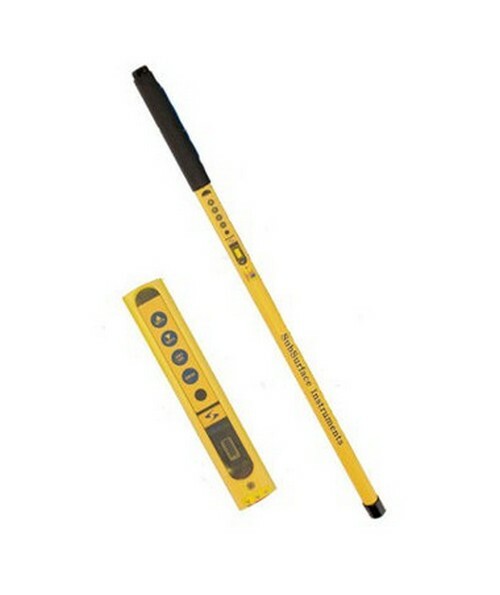 This durably constructed 40-inch magnetic locator can handle intense conditions of moisture or high impact. So, no matter how rough the environment, the ML-3 will maintain its precision. It can even locate in rainwater or snow. Along with the SubSurface ML-3 magnetic locator you will also receive a soft case, manual, and 7-year warranty.